Conserve water while also reducing pollution! Read more and take action! We are all hoping for heavy rains this winter to quench the dry landscape and provide some relief from the current drought. But with rain – in particular after extended dry periods — comes a deluge of pollutants running off dirty sidewalks and streets straight into storm drains, creeks and the ocean. Stormwater runoff is the number one source of pollution in our area, but the good news is that there are simple actions we can all take to help reduce stormwater runoff that also conserve water. By keeping rainwater on your property through redirecting it, slowing it down, capturing it and letting it soak into the soil through a rain garden, you can reduce stormwater flowing off your property into the street and picking up pollution along the way. Not to mention, if you capture rainwater in a rain barrel or cistern, you are saving water you can reuse at a later time. With basins, swales or rain gardens, rainwater infiltrates into the ground and is cleaned by microbes in the soil, revitalizing soils and in some cases, recharging groundwater. Install cistern or rain barrel to collect rain water. Check out Channelkeeper’s Rein the Rain Project (below) where we are repurposing used wooden barrels from local wineries and breweries and converting them into beautiful rain barrels. Click here for more info about how to install a rain barrel (in English and Spanish). There are many options for larger cisterns, including newer slim-line tanks for smaller spaces. Australia has done a great job incorporating rainwater collection systems following their thirteen-year drought . Check out tank options here. Redirect roof downspouts to drain onto the ground. We applaud all the water savers out there who let their lawns go golden during the drought, but with more than 60% of residential water use in southern California used for outside irrigation, we need to make a permanent shift to more sustainable, water-wise landscaping. Consider substituting unused lawn areas with drought-tolerant plants and installing rain gardens or swales to infiltrate rainwater back into the soil. Many local water districts have rebates available for making your landscape more sustainable with water-wise plants and upgrading irrigation. For more info on rebates, click here. Rein the Rain with Rain Barrels! In response to the drought, Channelkeeper is educating our community about ways to conserve water and providing tools to help them do it. Since outdoor watering makes up 50% of water use in our area, one tool we’re promoting is the rain barrel, in partnership with local brewers and vintners. In early 2015, Channelkeeper tested our Rein the Rain Project in a pilot phase, and it was so popular that we now have a waiting list of people who want our repurposed rain barrels. We’ve been reaching out to area brewers and vintners to repurpose oak barrels previously used in the beer or wine making process and convert them into rain barrels. 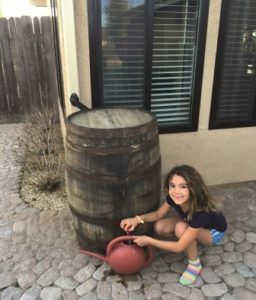 The repurposed wooden barrels make gorgeous rain barrels and are available for $100, which includes a simple kit to convert any barrel into a rain barrel as well as assistance with installation. We’re also offering the barrels at a discounted rate to low-income community members. We currently have many barrels to choose from at the Channelkeeper office. Please contact us to reserve one. Just 1/10 inch of rain on a 1,000 sq. ft. roof can fill a 60 gallon rain barrel. Over the course of a year, 1 barrel will help redcue water use by about 1,400 gallons! Use rainwater collected for watering your outdoor plants and save money on your water bill. Stormwater is the #1 source of water pollution in Santa Barbara. It is harmful to streams, the ocean, and the species that call these waters home. Rain barrels help reduce polluted runoff by capturing rainfall and storing it for use later. Check out this great graphic that UCSB Bren School students designed for Channelkeeper about the Rein the Rain project!